Jesse Livermore, the most famous trader of all time, made $100 million in 1929. Richard Dennis, the founder of the turtle traders, made $400 million trading the futures market. Ed Seykota, possibly the best trader of our time, achieved a return of 250,000%, over a 16 year period. And do you know what is their trading approach? Trend Following is a trading methodology that, seeks to capture trends across all markets, using proper risk management. Markets are driven by emotions, greed, and fear. When either side is in control, there will be a trend, and Trend Followers can take advantage of this phenomenon. Behind this trading methodology, lies 5 trading principles that every successful Trend Follower must follow. You walk into a supermarket and you see apples being sold, 3 for $1. So, you get some apples for a nice healthy snack. You go back to the supermarket and, realize the same apples are now being sold, 3 for $5. Probably not because the price is too high. You’d rather wait for the price to drop, or find other alternatives. What does buying apples have anything to do with trading? Because your attitude towards buying apples is brought over to your trading endeavor. The market is never too high to go long, or too low to short. It feels good to know you called the tops and bottoms in the market. However, when you start making predictions in the market, it clouds your judgment, and you start losing objectivity of the markets. Now, what should you do instead? The best thing you can do as a trader is, just follow price. If you notice the price is forming higher lows, with resistance constantly breaking, chances are it’s an uptrend. You should be looking to long. If you notice price forming lower lows, with support constantly breaking, chances are it’s a downtrend. You should be looking to short. You have a trading system that wins 50% of the time with 1:2 risk reward. It’s a profitable system, right? Having a winning system without proper risk management isn’t going to get you anywhere. You need a winning system with proper risk management. The recovery from the risk of ruin is not linear, it could be impossible to recover if it goes too deep. 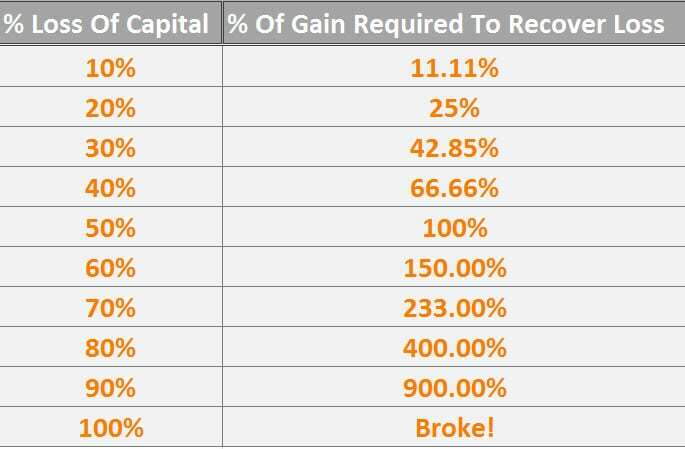 If you lose 50% of your capital, you need to make back 100% to break even. Yes, you read right. 100%, not 50%. That’s why you always want to risk a fraction of your equity, especially when your winning ratio is less than 50%. So, how much should you risk exactly? This depends on your winning ratio, the risk to reward, and your risk tolerance. I would advise risking no more than 1% per trade. Although trend followers have no profit targets, it doesn’t mean we don’t exit our trades. We exit our trades using a trailing stop mechanism, instead of having a profit target like support & resistance etc. The hardest part about Trend Following is riding your winners. Because you’ll watch many small wins turn into losses while attempting to ride the trend. This results in low winning rate but, high reward to risk. Markets spend more time ranging than trending. Thus, it makes sense to look at a variety of markets, to increase your odds of capturing trends. Trend followers trade everything from currencies, agriculture, metals, bonds, energy, indices, orange juice, pork bellies, etc. Trading across different markets help reduce your drawdowns and improve your profitability. And this is one of the biggest secrets behind a trend follower’s success. How does Trend Following have an edge in the markets? A company called Orange has been trading higher over the last 6 months. Orange currently trades at $100 and you think it’s overvalued. You decided to short 1000 shares of Orange, at $100 with a profit target at $90, using no stop loss. You apply this trading principle across all markets you’re trading. A small profit target with no stop loss. You’ll win often but, eventually, there will be a trade that goes against you, till you blow up your trading account. What if I’m on the opposite side of your trade? I would lose often but, all I need is one trade to make it all back, and more. And this is the same trade that caused you to blow up your account. Trend Following can be further divided into 2 different approaches. Systematic trading has defined rules that decide the entry, exit, risk management, and trade management. It requires usage of computer models, trading based on technical analysis, with limited intervention. This approach is widely adopted by big hedge funds like Dunn, Winton, and MAN AHL. Although systematic trading is automated, there are still key decisions that a manager has to make. 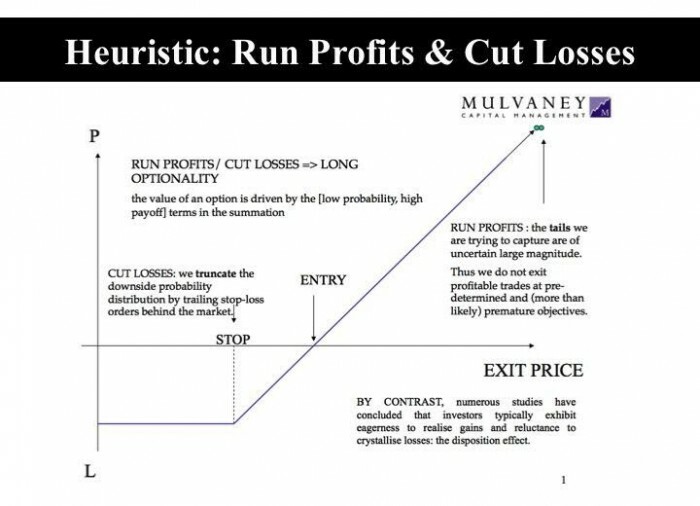 Discretionary trading has lesser defined rules that decide the entry, exit, risk management, and trade management. 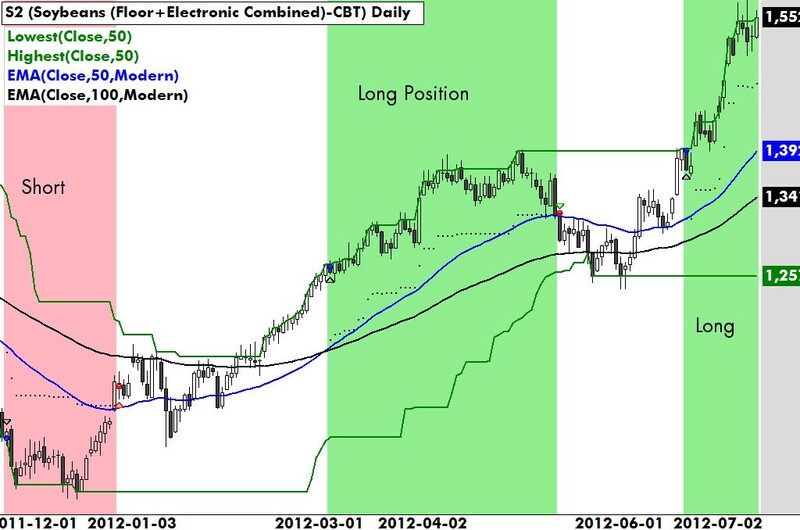 It requires a trader’s attention, trading based on technical analysis, with more intervention. This approach is widely adopted by smaller individual traders. Although discretionary trading is more subjective, it is still guided by a trading plan. According to research by Blackstar Funds, Trend Following can work well on stocks. Buying stocks at new all-time highs, and exiting them after they’ve fallen below a 10 ATR trailing stop, would have yielded a significant return on average. Now you’ve learned the 5 secrets of Trend Following. Let’s put the information to use and develop a trading strategy. You must choose a time frame that suits your personality and schedule. If you’re someone who holds a day job, trading the 4 hour and daily charts would suitable. You must risk a fraction of your equity on each trade to survive the inherent drawdowns. Keep your losses to no more than 1% on each trade. You should be able to trade about 60 markets from these 5 sectors. If 200ma is pointing higher and the price is above it, then it’s an uptrend (trading conditions). If it’s an uptrend, then wait for “two test” at the dynamic support (using 20 & 50-period moving average). If price test dynamic support twice, then go long on the third test (your entry). If long, then place a stop loss of 2 ATR from your entry (your exit if you’re wrong). If the price goes in your favor, then take profits when candle close beyond 50ma (your exit if you’re right). Vice versa for a downtrend. In his book, Following the Trend, Andreas Clenow reveals his Trend Following system. If 50 ema is above 100 ema, then look to go long. If you’re looking to long, then wait for the price to close above the 50-day high. If price closes above the 50-day high, then enter your trade at the next open. If a trade is entered, then have a stop loss of 3 ATR away from its peak reading. A complete Trend Following strategy that allows you to profit in bull & bear markets. To be honest, the strategy is least of your concern. Instead, you should focus on your risk management, markets universe and trading consistency. **Disclaimer: I will not be responsible for any profit or loss resulting from using these trading strategies. Past performance is not an indication of future performance. Please do your own due diligence before risking your hard earned money. You’ve just learned what Trend Following is all about.